Going to the LLNE spring meeting in Northampton on April 5th? Sign up for the dine around — enjoy great food and have some fun with colleagues and friends! Please email Brian Flaherty, brian2@bu.edu, or phone him: 617-353-1106, with any questions about the program. On Sunday, October 28th, members of the LLNE A2J Committee and the LLNE Service Committee presented at the New England Library Association Conference (NELA) in Warwick, RI. 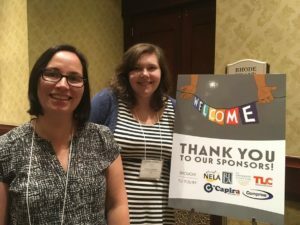 The presentation titled “Law, Technology, and Access to Justice” discussed the access to justice gap in both New England and the United States and how technology is being developed to help bridge the gap. The presenters showcased a variety of current and upcoming technologies that are focused on helping self-represented litigants prepare for court, such as RePresent, Objection! Your Honor, and the Odyssey Guide and File. The session also tackled ethical concerns and the unauthorized practice of law with presenters role-playing common legal reference scenarios to show setting boundaries with patrons. Finally, and most importantly, the presenters discussed LLNE’s Legal Link resource for providing legal reference and referrals. The session was well-received and the attendees were engaged with the material. The slides from the session have been uploaded and shared on the NELA website. 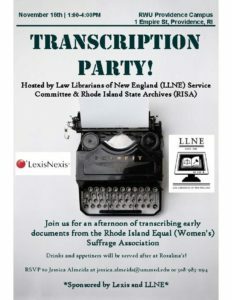 Join the LLNE Service Committee on Friday, November 16th for a Transcription Party! 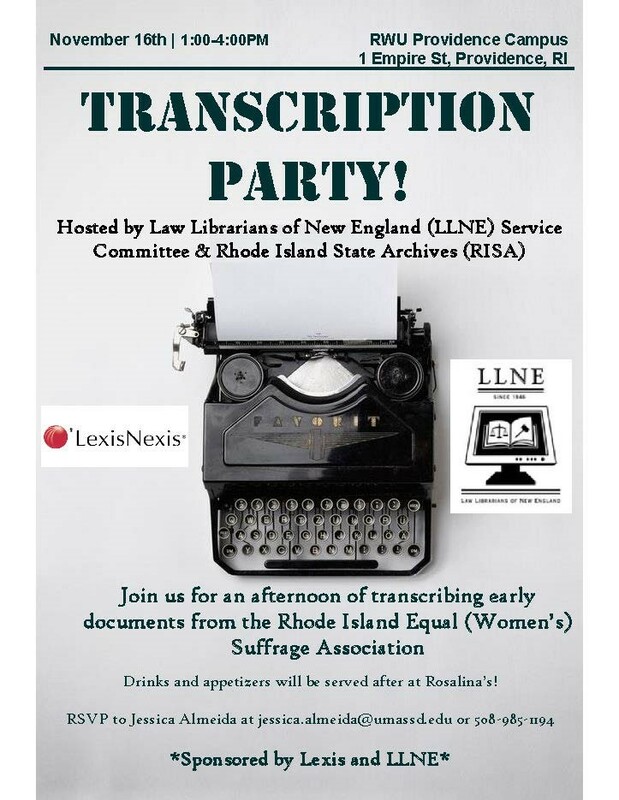 From 1-4pm, we will be at the Roger Williams University Providence Campus (1 Empire Street, Providence) transcribing historical documents from the Rhode Island State Archives’s Suffrage Association collection. Afterwards, come enjoy drinks and appetizers (and the company of fellow law librarians) around the corner at Rosalina’s (50 Aborn Street, Providence). No experience with transcription necessary! None of us have ever hosted nor attended a transcription party before so don’t worry if you are unsure about transcription! Come ready to have fun and help out a great organization! Please RSVP to Jessica Almeida at jessica.almeida@umassd.edu or 508-985-1194 by November 9th . Computers will be available on site or you are welcome to bring your own. Parking is available on the street or at the Providence Civic Center Garage located on Washington Street. Posted on November 6, 2018 Author Diane D'AngeloCategories ServiceTags serviceLeave a comment on Join the LLNE Service Committee on Friday, November 16th for a Transcription Party!